A single weather statistic stood out for me last week when we were camping at the Bellingen Showgrounds. This, from the Sydney Morning Herald: Australia was home to 15 of the hottest places on earth on January 15th. Meanwhile, my sister in Tucson, Arizona, was complaining about the sudden cold snap they were experiencing, accompanied by snow. Snow in this sun worshippers’ Mecca! Unheard of! I know, though, that she will experience 105 degrees F. temperatures and 95% humidity come summer, much like us Aussies. Extremely hot summers are likely to be the fallout from global warming, and this means they will gradually get worse. We broke down and installed an air conditioner 14 months ago, a good investment, but not everyone can afford this expense. 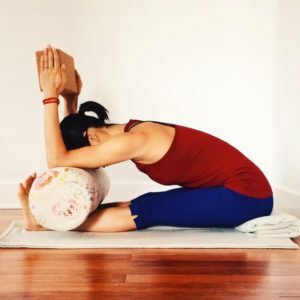 So what are we yogis supposed to do in this time of discomfort and perhaps difficult adjustments? Probably just what we have been doing. Keeping up yogic practices: asanas, pranayama, meditation, relaxation. And, particularly in the summer heat, let’s do quiet, cooling and calming yoga practice. Save the jumping around and through. Spare yourself sweating the long timings in poses. Keep the goal-seeking, perfection part of your personality in check. And chill. This is the sequence I’ve done the last few mornings. Except for the headstand preparation, all the poses can be held for 5 to 10 minutes. Supta Baddha Kanasana with all the props. Lying over a block with head support. Legs up the wall pose with bolsters, blanket and sandbag (on feet). Thats for sure no jumping around! I’ll try and get a few in today, ahh legs up the wall, nice!